On Saturday, July 2, 2016, the feast day of St John of Shanghai and San Francisco the Miracle-worker, the Cathedral of the Mother of God “Joy of All Who Sorrow” in San Francisco, CA, hosted the 50 th -anniversary celebrations of the repose of this wondrous holly man of God. 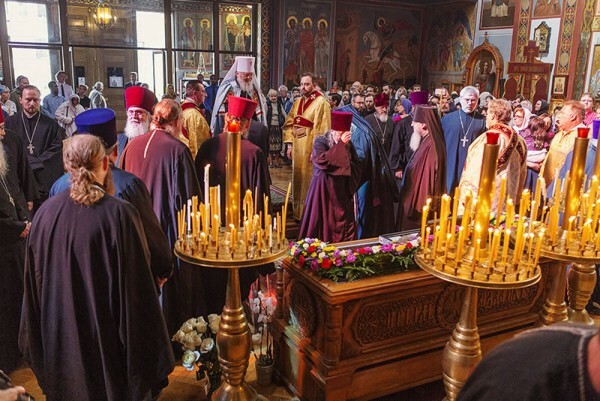 Divine Liturgy was celebrated by a large host of archpastors and clergymen of the Russian Orthodox Church Outside of Russia, headed by His Eminence Metropolitan Hilarion of Eastern America and New York, First Hierarch of ROCOR. An enormous gathering of worshipers was present, including both local faithful and pilgrims from throughout the world who venerate the memory of the ascetic life and achievements of the great hierarch of the Russian diaspora. Metropolitan Hilarion was joined in the service by His Eminence Archbishop Mark of Berlin and Germany; His Eminence Archbishop Kyrill of San Francisco and Western America; His Eminence Archbishop Gabriel of Montreal and Canada; His Eminence Archbishop Peter of Chicago and Mid-America; His Grace Bishop Nikolai of Salavat and Kumertau (Bashkortostan Metropoliate of the Moscow Patriarchate), Bishop Theodosius of Seattle, Vicar of the Western American Diocese; His Grace Bishop Nicholas of Manhattan, Deputy Secretary of the Synod of Bishops; His Grace Bishop Paisy of Timoshuransk (Romanian Orthodox Church), and His Grace Bishop Nikolai, formerly of Sitka and Alaska of the Orthodox Church in America, now retired and a member of the episcopate of the Russian Church Abroad. Also serving was Archimandrite Irinei (Steenberg) of St Tikhon of Zadonsk Church in the former orphanage, who holds several officese in the administrations of the Synod and of the Western American Diocese; Mitred Protopriest Victor Potapov, Rector of St John the Baptist Cathedral in Washington, DC; Mitred Protopriest Stefan Pavlenko, Rector of the Church of All Russian Saints in Burlingame, CA; Mitred Protopriest Peter Perekrestov, Senior Priest of the cathedral, as well as clergymen of the various diocese of the Russian Church Abroad, representatives of other Orthodox Churches and other pilgrims in clerical rank. 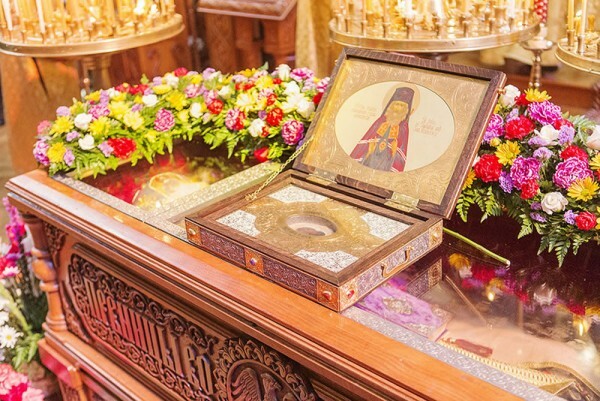 Situated at the center of the cathedral were the Kursk Root Icon of the Mother of God “of the Sign” and the crypt containing the uncorrupt relics of St John of Shanghai and San Francisco. Vladimir Krassovsky led the magnificent Archbishop’s Choir. 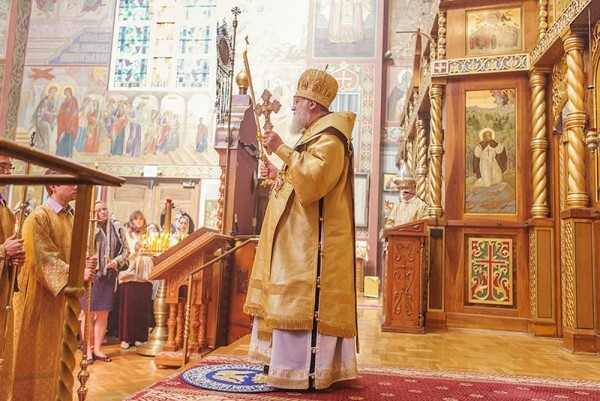 During the minor entrance, in accordance with a decision by the Synod of Bishops, Priest James Steele of St Elias Church in Placerville, CA, was elevated to the rank of Protopriest; and Protodeacon George Khrebtov, successor to the recently-reposed Protopriest Nicholas Triantafillidis as the chief deacon of the cathedral, was granted the right to wear the kamilavka. Fr Irinei then read a profoundly-resonating sermon before Holy Communion, of which hundreds of parishioners partook. 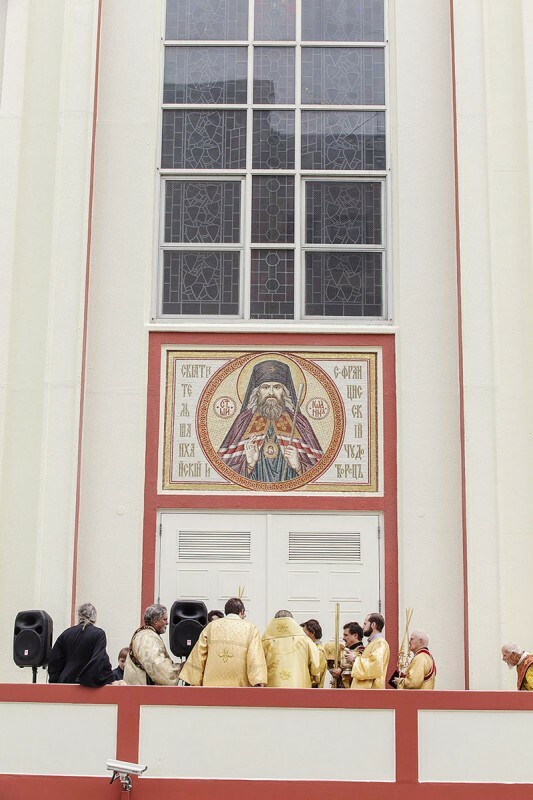 After Divine Liturgy, a moleben with procession of the cross around the grand cathedral was held during which a new mosaic depicting the great hierarch of the Russian diaspora, St John, was consecrated. The image, created by master mosaic-makers in Moscow, was hung above one of the cathedral’s entrances. The procession concluded with praises to St John sung before his uncorrupt relics, at the end of which Metropolitan Hilarion read the prayer to him composed by Archbishop Anthony (Medvedev), who succeeded him on the cathedral of Western America, and who initiated the uncovering of the saint’s relics, which were discovered to be uncorrupt. 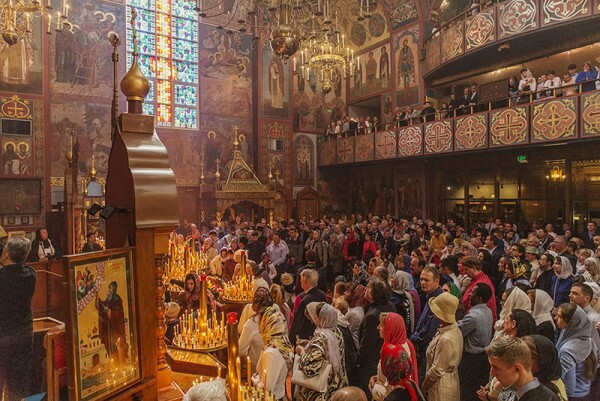 After Liturgy, Metropolitan Hilarion addressed the worshipers with a sermon in which he called upon all in attendance to emulate the holy hierarch to the best of their ability, prayerfully and actively doing good works, seeking personal contact and living communion with God through piously participating in divine services and kindness to one’s neighbors, manifesting the commandments of the Gospel of Christian love, patience and humility. Addressing Archbishop Kyrill, Metropolitan Hilarion expressed his profound gratitude to the Ruling Bishop of the Western American Diocese, to his Vicar Bishop Theodosius and to all the clergymen present, to the parishioners and sisterhood of the cathedral, and of the Old Cathedral of San Francisco, to the parish in Burlingame and all those who helped organize the 50 th -anniversary celebrations of the repose of St John, and who were so hospitable to the hierarchs and visiting pilgrims. Before the intoning of the proper Many Years, Hierodeacon Peter (Karakozov) read the text of a decree of blessing granted to Vasily Vasilievich and Ekaterina Vladimirovna Anisimov, who donated the funds for the grand mosaic of St John. Attending the reception that followed, held at the Russian Center in San Francisco, were not only the aforementioned archpastors, clergymen, parishioners and pilgrims, but also Russian Consul General in San Francisco Sergey Petrov; Cathedral Warden Nikita Buick, President of Russian-American Community Services; the surviving spiritual children of St John and many others, who, after hearing a brief biography of the saint, spoke warm words of greeting.